A model organism is a member of an easy-to-study species that is used in experiments to learn how a more complex organism functions. Biomedical research relies heavily on model organisms as stand-ins for humans, but other types of research use these organisms too. For example, the small mustard relative Arabidopsis thaliana is a favorite model organism of biologists who work with plants. Most models of the human are vertebrates, such as rodents and primates, but even an organism as simple as a yeast can provide valuable insights and information about life at the molecular and cellular levels. Model organisms typically have very short life cycles, enabling researchers to observe them over many generations. Arabidopsis, for example, has a life cycle of just six weeks or less, giving plant scientists peeks at such activities as flowering, reproduction, defense against pests, and hormone signaling. In addition, model organisms can be bred for genetic uniformity and the environmental conditions manipulated, so that researchers can pinpoint the sources of particular responses. Model organisms have been staples of biomedical research for decades, but they are even more valuable in the twenty-first century because they can be engineered to harbor human genes in each of their cells. An organism that has genes of a different species is termed transgenic . The story of the discovery of the cause of Type I diabetes mellitus illustrates the role of model organisms in human health care. In this condition, the pancreas does not secrete the hormone insulin, leading to glucose buildup in the bloodstream, which causes weight loss, weakness, and many other signs, symptoms, and complications. It was once swiftly lethal. In October 1921, a young surgeon at the University of Toronto named Frederick Banting was pondering earlier work that had shown that removing a dog's pancreas leads to symptoms identical to those of diabetes in humans. Would giving such a dog an extract from a pancreas reverse the symptoms? If the dog's predicament was similar to people with diabetes, might an extract help them, too? Banting and an assistant, Charles Best, addressed these questions in a small lab, with ten dogs. They removed the pancreas from one dog, and it soon developed symptoms. From a second dog, they tied off the pancreas, then removed it and obtained an extract, which they injected into the first dog. It recovered, although only for a day (diabetes requires daily insulin injections). A friend of Banting's became the first person to receive insulin, derived from fetal calves, and within two years insulin replacement therapy was in widespread use. Today, people with Type I diabetes mellitus obtain insulin not from cows or dogs, but from Escherichia coli bacteria given genetic instructions to produce human insulin. Experiments on dogs led to other advances in medical technology, including open heart surgery, cardiac pacemakers, heart transplants, and coronary bypass surgery. Dogs haven't been alone. Diphtheria vaccine was tested on horses, polio vaccine on rabbits, and AIDS (acquired immunodeficiency syndrome) vaccines on chimps, macaques, cats, and mice. Using nonhuman animal models of human genetic diseases is commonplace (dogs for muscular dystrophy, and mice for sickle cell disease, for example). Researchers must choose model organisms carefully, or their use can lead to misinterpretations. For many years, microbiologists extrapolated from the widely studied E. coli to other microorganisms, missing a great deal of natural microbial variation. Similarly, some vertebrates given human diseasecausing genes nevertheless do not develop similar symptoms, due to differences in physiology or metabolism between the species. For example, Lesch-Nyhan syndrome in humans causes self-mutilation, yet the same metabolic defect in mice has no apparent effect. An organism's development must be considered too in selecting a model. Mice, for example, are three thousand times smaller than humans, grow about one hundred times as fast, and age thirty times faster. These differences may explain why cancer treatments that work in mice do not necessarily help people. 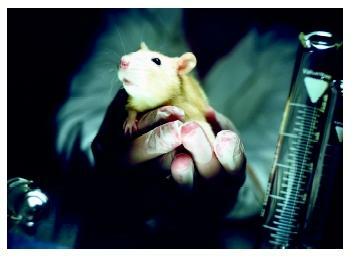 Mice have helped in developing treatments for seizures, multiple sclerosis, AIDS, and rejection of organ transplants. Mice also do not live long enough to develop degenerative conditions associated with aging in humans. Still, mice are routinely used in preclinical investigations. They have helped in developing treatments for seizures, multiple sclerosis, AIDS, and rejection of organ transplants. Different species provide different types of information, depending upon how closely they approximate the corresponding human condition. For example, pigs were used to pioneer heart surgery because their cardiovascular systems are remarkably like that of humans, and their organs are similar in size to those of humans. Mice are models for various forms of hereditary deafness, because their inner ears are structurally very similar to those of humans. A varied list of organisms has revealed the earliest stages in building an animal body, including sea urchins, frogs, worms, and fruit flies. In pharmaceutical research, rats have modeled human reproduction, endocrine function, nutrition, and cancer. The rat's larger size compared to a mouse enables researchers to sample blood from the same animal over time, and to maintain the animal's body temperature and anesthesia level during surgery, which is much more difficult to do in mice. Rats are also more intelligent, making them useful in behavioral studies, and they tend to have more consistent litter sizes than mice. Model organisms have proven so integral to research that in the late 1980s, the planners of the human genome project insisted that several nonhuman genomes be sequenced first. This enabled researchers to perfect deoxyribonucleic acid (DNA) sequencing technologies, and also provided a treasure trove of genes to which human genes can now be compared. Understanding how a gene functions in one species can provide clues to what it does in the human body, information that can be valuable in developing new ways to diagnose and treat disease. Since 1995, several dozen genomes have been sequenced, including those of many model organisms. The first step in investigating the function of a human gene is to seek matches in databases of gene sequences from other species. Consider long QT syndrome, an inherited cardiac arrhythmia that causes sudden death in otherwise healthy young adults, usually athletes. Investigation of the nearly identical gene in the fruit fly revealed the cause of the defect-abnormal channels for potassium ions in the cell membranes of heart cells. As genomes continue to be sequenced, researchers will be able to ask more questions, and to seek the answers using model organisms. Lewis, Ricki. "Flies Invade Human Genetics." The Scientist 12, no. 13 (June 22, 1998): 1. ——. "How Well Do Mice Model Humans?" The Scientist 12, no. 21 (October 16, 1998): 1. Palevitz, Barry. "Arabidopsis Genome: Completed Project Opens New Doors for Plant Biologists." The Scientist 15, no. 1 (January 8, 2001): 1.